Illustrations: 12 figures, 19 b/w photographs, 9 maps, 5 tables. The unique arts-and-crafts tradition of the American Southwest illuminates this economic and social history of colonial New Mexico, casting new light on the development of New Mexico's Hispanic community and its changing relationship with Pueblo Indians. Ross Frank's analysis of Pueblo Indian pottery, Pueblo and Spanish blankets, and Spanish religious images—or santos—links economic change to social and cultural change in this region. Using these cultural artifacts to gauge shifts in power and status, Frank charts the creation of a culturally innovative and dominating Hispanic settler—or vecino—community during the final decades of the eighteenth century. Contrary to previous views of this period as an economic backwater, Frank shows that Spanish New Mexico instead experienced growth that tied the region closely to colonial economic reforms of the Spanish empire. 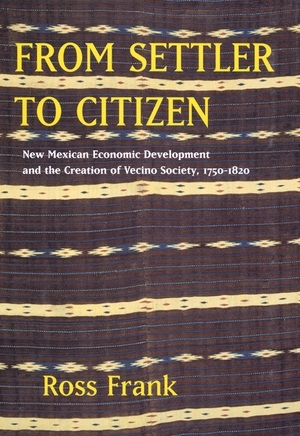 The resulting economic boom dramatically altered the balance of power between the Spanish settlers and the Pueblo Indians, giving the vecinos the incentive and the means to exploit their Pueblo Indian neighbors. Frank shows that the vecinos used different strategies to take control of the Pueblo textile and pottery trade. The Hispanic community began to define its cultural identity through the economic and social subordination of the Pueblo Indians. 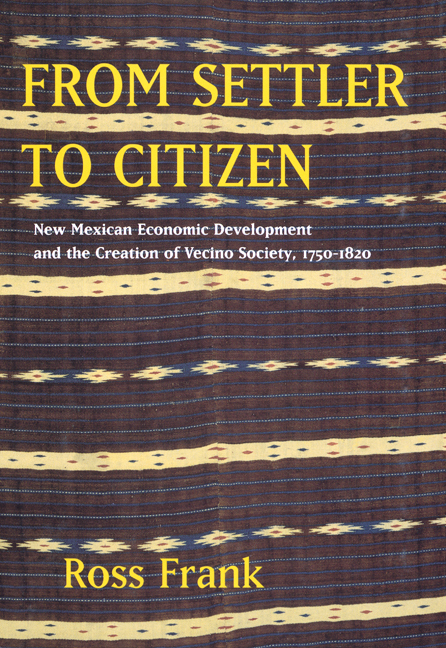 Connecting economic change to powerful cultural and social changes, Frank provides a new understanding of this "borderlands" region of northern New Spain in relatoin to the Spanish colonial history of Mexico. At the same time, From Settler to Citizen recovers the previously unexplored history of an important Hispanic community. Ross Frank is Associate Professor of Ethnic Studies at the University of California, San Diego.